In The US, There Is Only One Father-Son Duo To Win An Olympic Gold Medal In The Same Event Charles & Chip Jenkins in the 400 & 4 x 4. Phillips Idowu Calls UK Coach A Liar, Says "I don't need this kind of rubbish." "I've not tweeted once about my withdrawals until after I've told the official channels but it's not coming across like that and if Charles is still saying that we had a conversation ... that's a blatant lie." Christophe Lemaitre Known More For The Color Of His Skin Than His Times He shares that he was invited on a "courtesy" visit by the Klu Klux Klan, but ignored the letter. Day 1 Recap: World Leads In Men's HJ And Women's Javelin/Pole Vault Ukrainian HJer Dymtro Demyanyuk tied world lead to win with 2.35m. GB Captain Dai Green Leads Team With 400m Hurdles Win Russia's Savinova beat UK's Jenny Meadows in the 800 - 1:58.75 to 1:59.47. 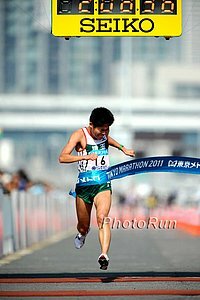 July 3rd Sapporo International Half Marathon 2010 World Half Champ Florence Kiplagat, Asian Games champ Youngiun Ji and Tokyo Marathon star Yuki Kawauchi headline fields. 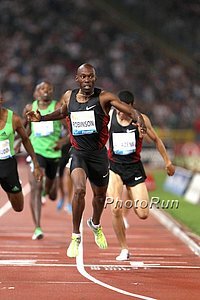 David Rudisha's Return Highlights Lausanne Diamond League Meet On June 30th The 800 will be Rudisha vs. World champ Mbulaeni Mulaudzi and Kenya's Alfre Kirwa Yego. The men's 5k also has a deep field led by Imane Merga and Tariku Bekele and includes 7 sub-13 minute runners. 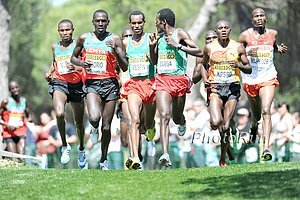 IAAF Preview Of June 18th World Long Distance Mountain Running Challenge Distance of 38km (2,500m uphill and 2,800m downhill). The US will defend its 2010 Men's and Women's titles. Mary Cain On Her 4:17.84 Last Week: "I ran like I was being chased by a pack of jaguars, which I was." NATIONAL RECORDS SET ON DAY TWO OF NEW BALANCE OUTDOOR NATIONALS Aisling Cuffe ran 9:54.22 to break Molly Huddle's 2-Mile NR. 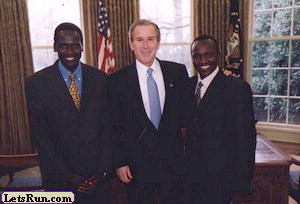 Coaching Issues, Lack Of Support Have Led To Olympic 800m Champ Pamela Jelimo's Fall In one season, she won the US$1 million IAAF Golden League jackpot, set the world junior record (1:54:01), remained unbeaten in 13 races and became the first Kenyan female athlete to win Olympic gold in Beijing. 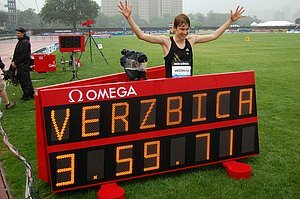 Now 3 years later, she is getting last place in the Pre Classic 800 and no one knows if she will get back to the top. 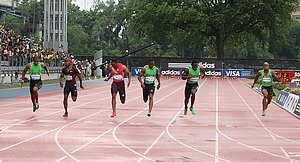 Jamaica Trials Will Be Extremely Feature An Extremely Deep 100m As reigning World Champ Usain Bolt gets a free pass, so that leaves 7 other sub-10 second runners to fight for 3 spots. They are Steve Mullings, Nesta Carter, Asafa Powell, Michael Frater, Yohan Blake and Nickel Ashmeade. Usain Bolt Throws A Jab At Tyson Gay Via Twitter Bolt tweeted: "I think some athlete need to get them self a girl so they can get there mind off me" - insinuating that Gay has no life outside track. 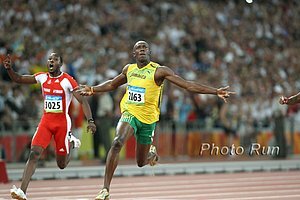 US Playing Catchup To Jamaicans In Women's 100 Bolt says it like it is: "I think it is all about where the talent is from. The majority of Europe is very much switched onto football. The USA is NFL, MLB and basketball; Canada is ice hockey. Jamaica is sprinting - we do a lot of track and field here." Euro Team Champs Via Twitter van Commenee says, he would expect a world champ like Idowu to "represent Britain with a certain responsibility and dignity." So would we, which is why we were surprised by Idowu's follow tweets, where he tweeted: "Read this crap!," followed with a link to van Commenee's comments. Former Olympic/Three Time World Champ Carolina Klüft Rules Out Return To The Heptathlon She says she doesn't have the "motivation or energy" for it and will focus on the LJ. 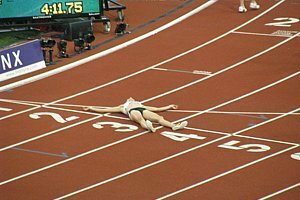 She will retire after 2012 and no longer wants to be involved in the sport. Blanka Vlašić Admits To "Big Pressure"
Russia's Olympic Bronze Medallist Tatyana Chernova Wins IAAF World Combined Events Challenge Just 17 points short of Jessica Ennis's world lead. Matt Hughes Talks About Being A 2x NCAA Champ In The Steeplechase "... it makes you realize you just need to find a sport you're good at, something you love, and work hard at it and your dreams can come true."